As our season is slowly winding down and our fishing is getting better everyday. It's nice to report we are having nice weather and warmer than normal temperatures for this time of the season. Our water levels are back to where they're supposed to be at this time of the season with temperatures in the 50 plus degree range. The Bonaventure, Petite Cascapedia and Grand Cascapedia are all at normal levels for this time of the season, we could use a little rain but conditions are ok at the moment. 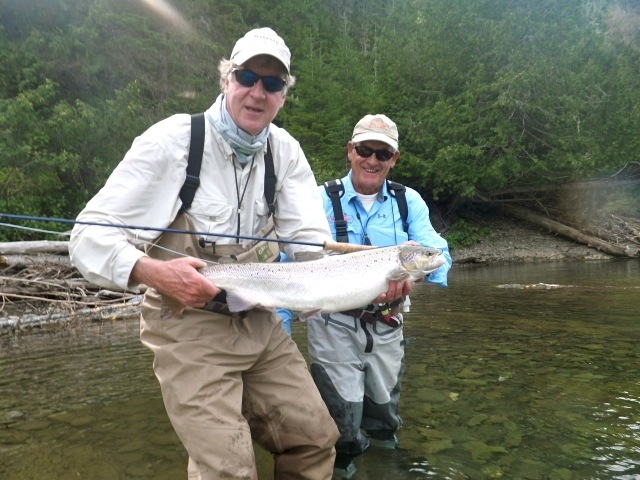 Roger wuest with his first Grand Cascapedia Salmon, Congratulations Roger! 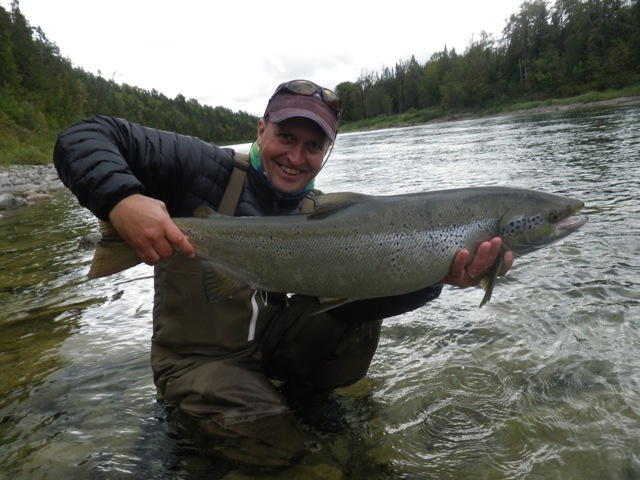 The Grand has been fishing exceptionally well and we've been catching good numbers of salmon everyday, September is always good on the Grand especially for big salmon, one of our favorite times of the4 season. 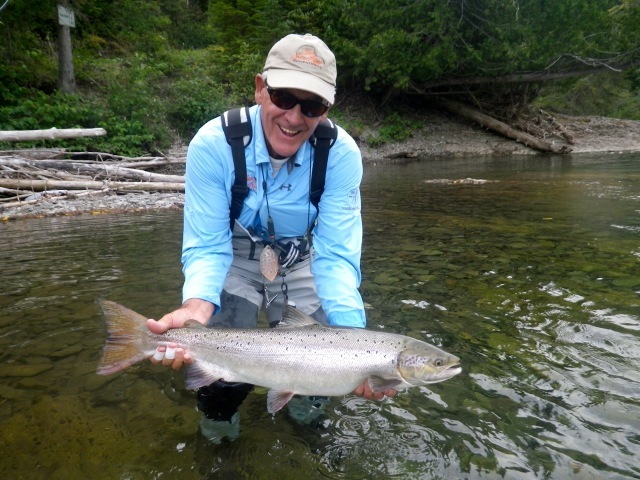 We're seeing a good number of fresh fall run salmon on the Bony and most of our lower pools have fresh fish. 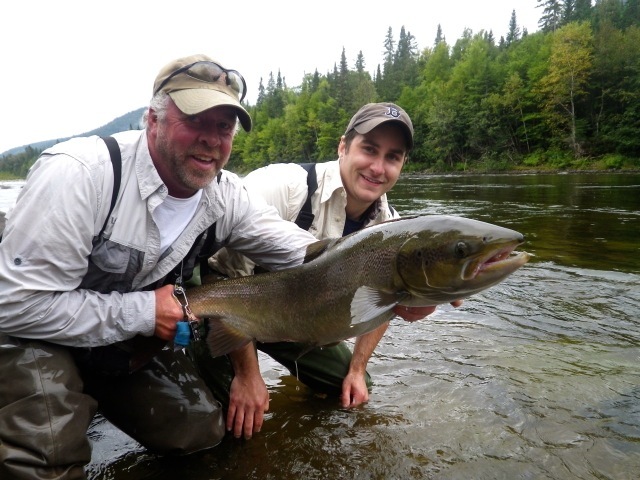 The Petite is also receiving a fall run and fishing has picked up considerabley over the past week. Matthe Schouten land a nice fish from the Grand, Nice fish Matthe! We are now heading into our last week of 2014, with good numbers of fresh salmon and favorable water conditions it should end in a bang! Daniel McGraw and Salmon Lodge Larry Dee put one back to swim again! Niece fish Daniel. Warmer water temperatures are allowing us to fish dry's and they continue to produce well. Tube fly's are also working well along with streamers. The hot fly's this week are the Red Francis, Out to Lunch and John Olin, Dry's in Brown, Green and Blue. We did catch a few on a bright orange bonmber as well. Charles St-Pierre with anotgher big fish from the Grand Cascapedia, Nice fish Charles!